Sometimes love is sweeter the second time around. I'm thrilled how my second short story of the day turned out to be a success, especially since I struggled to connect with the previous story I'd read earlier. This was my first time picking up anything by Rachel Gibson and I'm happy to report that it was a positive experience. I'm not sure why I hadn't tried her before, but I think I might have been under the impression that I'd be reading bargain-priced-grocery-store-style-basic contemporary romance. And maybe this wasn't all that far off in style, but I don't care because I honestly enjoyed Blue by You. ...and managed to fit my current mood perfectly. Kasper and Blue met when she was 18 and he was 21. Their instant chemistry fueled a passion-filled experience. Then before Blue could even process what had happened, Kasper was gone. Over two decades later, these two cross paths again. The magic is still there, but Blue doesn't feel like she's able to open her heart up to the man who broke it once. I don't always like flashback scenes, but Kasper and Blue's original meeting was handled in such an intense and beautiful way that I was completely caught up in their chemistry. The first stirrings of young love is a feeling which so many of us can relate to. By allowing us to see the past, it guides the reader to dare to hope for what could be. I was drawn right back into Kasper and Blue's love affair when they met again, even though twenty two years had passed. Because I knew the past, I was invested in wanting their lives to come full circle. "You make me ache," he whispered against her cheek. The "deep south" setting felt like a third character and the history of the rivalry between Blue and Kaspar's families was downright amusing - think Hatfields and McCoys. The relationship was built on teasing banter, and was revived on teasing banter. These two were quite the pair. "Believe it or not, we have better things to do at Dahlia Hall than gossip about your family." "Like marry your cousins and make big-headed babies?" Weren't the Pennington men supposed to be sugar-mouthed? "That hasn't happened in a hundred years!" Or so. It was kind of a touchy subject. It's rare that I find a short story which manages to include enough detail to make for a rewarding read. Blue to Youmanaged to do this and leave me satisfied when I was finished. 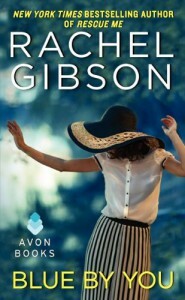 I will definitely be looking to read more Rachel Gibson in the future after being impressed by this short little gem of a story.